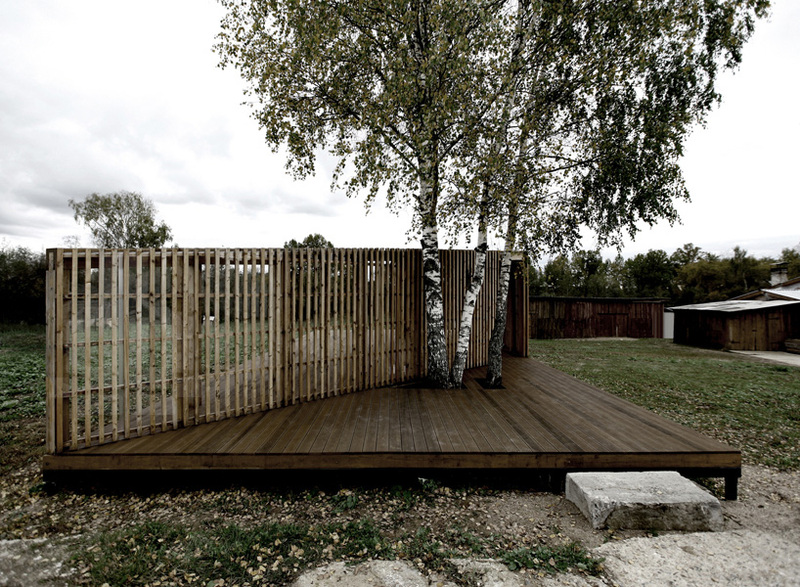 milan- and moscow-based firm khachaturian architects have constructed ‘summer house’, a slatted wood enveloped patio that is positioned nearby a plant. 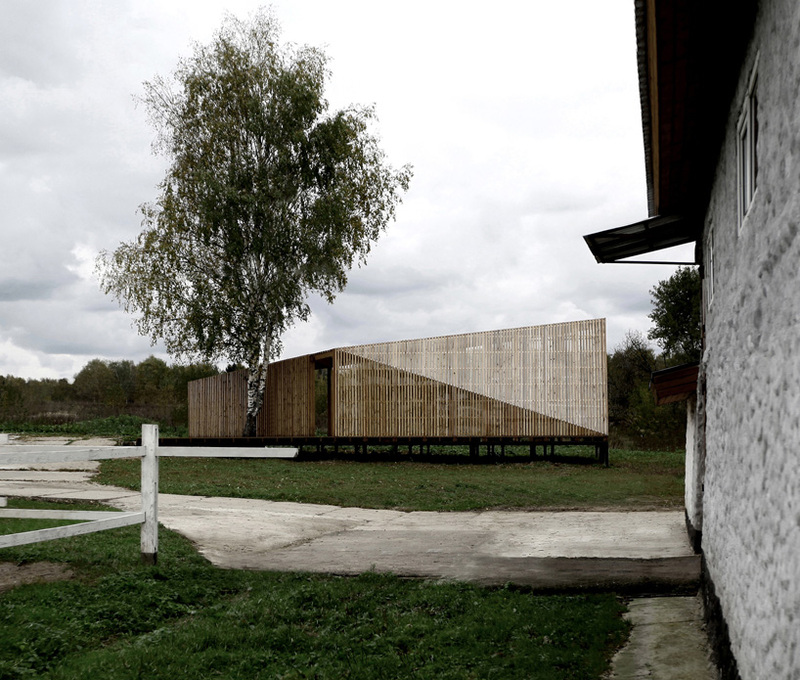 positioned away from the road and industrial noise, the primary objective in designing the structure was to limit visual contact with the factory, and open up views towards the surrounding natural landscape. this is achieved through the shape of the arbor, whose façades are positioned at a particular angle in order to also maintain an intimate atmosphere within. the volume sits on a rectangular platform and is divided into three spaces. the first is an open area, facing the factory and which defines the entrance to the pavilion. at the heart of this zone one finds a tree that offers shade from the summer sun. the two other programs are shielded from the factory. 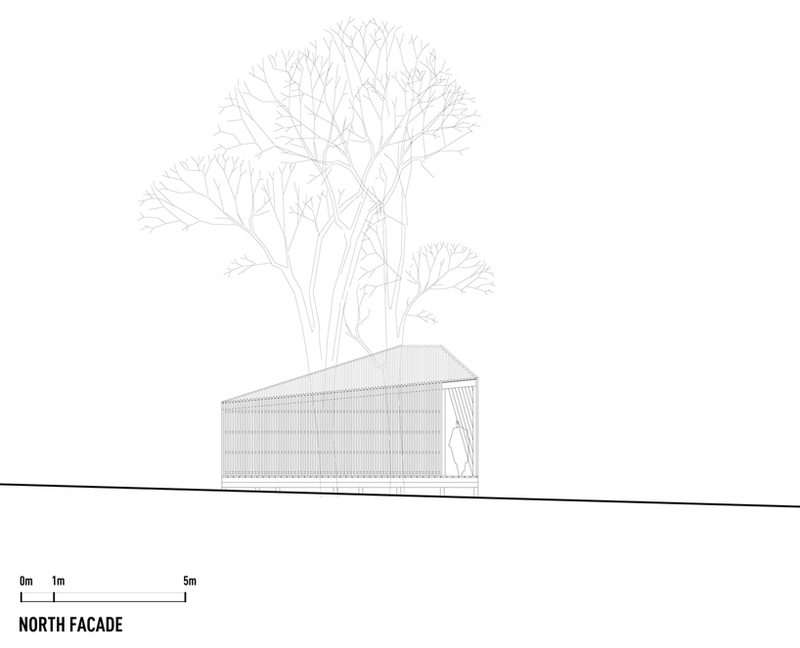 one is the covered portion of the arbor, consisting of more and less open sections that create an opportunity for functional separation of the internal quarters, and the other is the open terrace looking at the forest. 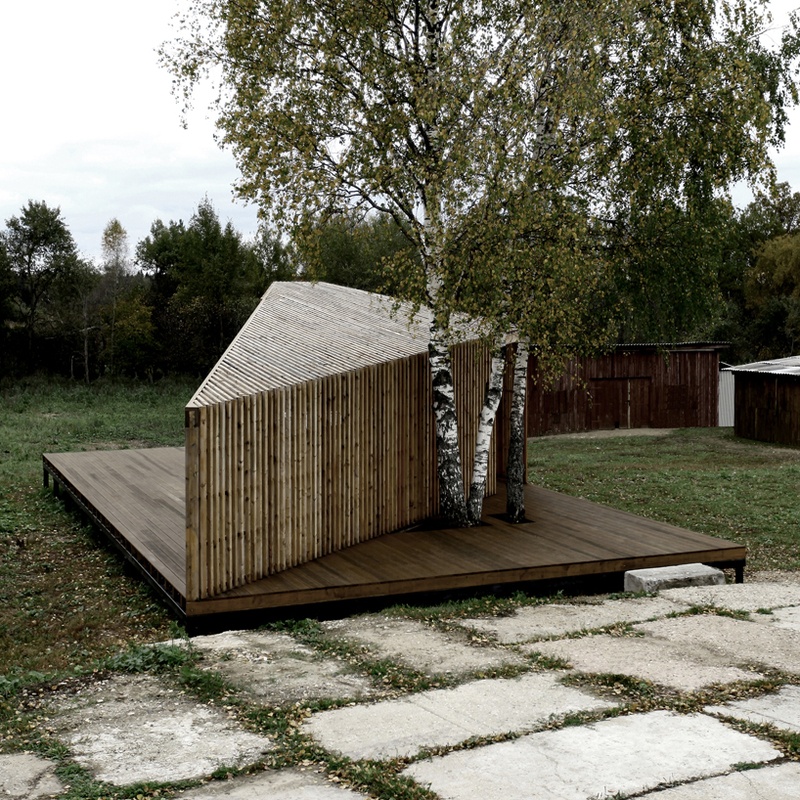 the slope of the roof is designed to be a continuation of the façade, maintaining the integrity of the ‘summer house’. the western edifice is fractured diagonally to create a milder shape and transition to more of a human scale, as the maximum height mark is four meters from the terrace level. the entire volume of the arbor is formed by its structure; there are no hidden substructures. the main building material is natural wood, resistant to russia’s climate. 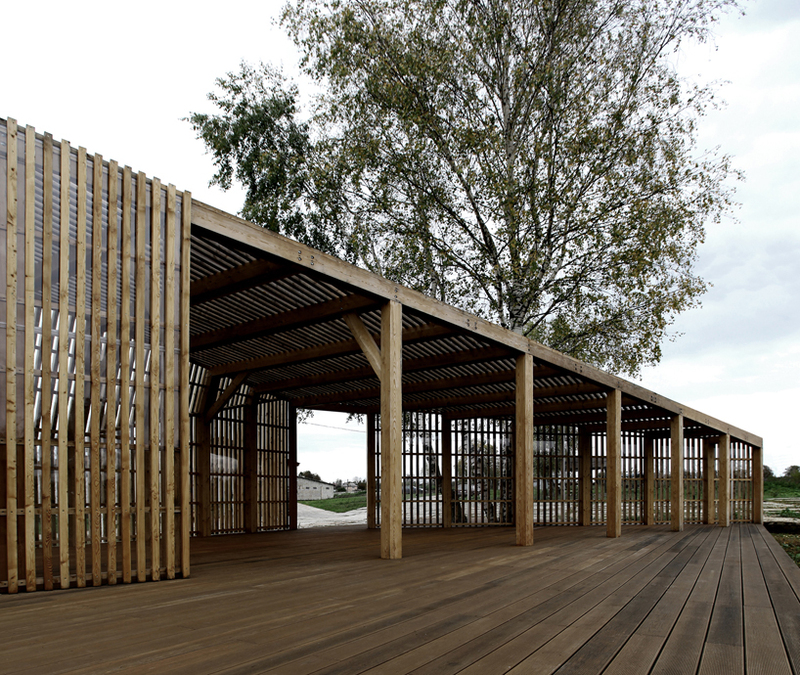 the external partitions are made of wooden slats, which are attached to the structure along with polycarbonate. during the day, depending on the movement of the sun, the space is filled with different patterns of light and shadow, as the project was carried out with maximum attention to details and nodes.